In the quest for competitive CSP, storage is a must. Decades ago, America dominated the development of an innovative technology that provides clean baseload power. The power plants were expensive upfront to build, but they could be counted on to deliver reliable electricity for decades to come. Today, however, the technology is challenged in the U.S. by cheap natural gas, ever-cheaper renewables, and a difficult regulatory environment. Consequently, plant construction has come to a near-standstill and developers are moving into energy-hungry emerging markets in order to find willing buyers. This is not a story about nuclear power. Rather, it's about concentrating solar power. From the early 1980s through the early 1990s, America installed 11 plants in the Southwest with more than 400 megawatts of capacity. But as government support for solar R&D dwindled, expensive commercial CSP plants couldn't compete on their own. The industry languished. The so-called "sleeping giant" of solar awoke in 2007, when Acciona commissioned the 64-megawatt Nevada Solar One trough project -- the first utility-scale CSP plant built in a decade and a half. Buoyed by state renewable energy mandates, higher natural gas prices, and national political momentum to act on climate change, CSP looked to be a sure winner. The Department of Energy (DOE) projected that 20,000 megawatts of CSP could get built in the U.S. by 2020, and offered tens of millions of dollars in support. But high capital costs and competition from cheaper alternatives like natural gas and solar PV have eroded the once-hearty CSP pipeline. There are now 1,685 megawatts of CSP plants in operation in the U.S. -- the result of a boomlet supported by the DOE over the last eight years. 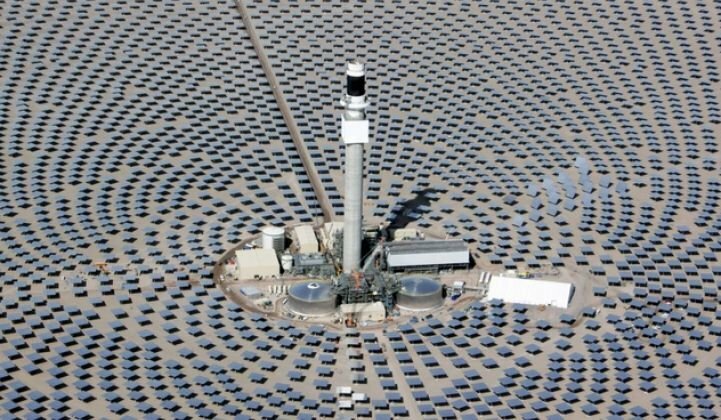 However, only one plant, SolarReserve's 110-megawatt Crescent Dunes project in Nevada, is slated to come on-line anytime soon. By comparison, 2,722 megawatts of solar PV projects were connected to America's grid in just the first half of 2015. The U.S. PV industry will be installing 1 gigawatt per month on average between now and 2017. With CSP development activity in the U.S. sluggish, executives have been asking themselves where they should turn. The answer: international markets, new investments in R&D, and storage. Above all else, storage is a must. "Without storage this technology isn’t worth much," said David Ramm, CEO of BrightSource Energy. At this week's Solar Power International conference, a group of executives from Abengoa Solar, BrightSource Energy and SolarReserve spoke about where opportunities lie for their businesses. While they still plan eventually to build projects in the U.S., the three companies are turning to countries where they say CSP with storage offers a higher value. "A lot of us are running around internationally," said Kevin Smith, the CEO of SolarReserve. "These are countries with less-developed grids where the value of storage is better realized." China, Chile, South Africa and countries in the Middle East are primary targets. Most have time-of-day pricing, and are in need of power plants with high capacity factors to balance their underdeveloped grids. That makes CSP with thermal storage or batteries the perfect candidate, they all agreed. While the American market stagnates, international development is growing modestly. BrightSource is bidding on two projects in South Africa and partnering with Shanghai Electric to build a series of projects in China. The company is planning two 135-megawatt towers with molten salt storage. It eventually wants to build four more. "We’re very focused on China right now," said BrightSource's Ramm. SolarReserve has recently shifted toward solar PV development. But it is still focused on CSP with molten salt storage in emerging markets. The developer has approval to build a 260-megawatt tower project with storage in Chile, which could go into operation in 2019 if all goes as planned. "A lot of our facilities are combining PV with solar thermal and storage. [SolarReserve] is pricing in Chile well under 10 cents by providing round-the-clock power," said Smith. Abengoa, which has built 13 trough projects and two towers around the world, is also very active in Chile and South Africa. It has approval for a 210-megawatt power plant in Chile made up of 100 megawatts of PV and a 110-megawatt power tower that will provide up to 17.5 hours of thermal storage. Abengoa is also currently building a 110-megawatt project in Chile with 17 hours of storage. "The storage component is revolutionizing the way we deploy solar power," said Fred Redell, managing director of Abengoa Solar. But that revolution has not yet come to the U.S. The executives all blamed immature regulation that doesn't specifically price the capacity value or frequency regulation services that CSP with storage can provide. According to an industry analysis published in 2014 by the Concentrating Solar Power Alliance, the technology is more competitive than intermittent renewables when adding up its various benefits to the grid. "These...include the long-term energy, ancillary service and capacity benefits, and can be reasonably shown to provide an additional $30 to $60 per megawatt-hour, or even higher, of benefits when compared to a PV plant with equal annual energy production in high-renewable-penetration scenarios," concluded the report. However, even in progressive states like California, the methods available to evaluate CSP's contribution to the grid are limited -- and thus, so is compensation for operational flexibility and frequency response services. "To date, the different states and utilities with sufficient direct normal insolation have a mixed record with respect to valuation of CSP with thermal energy storage, and generally have only recently begun to develop and implement...long-term simulation models," states the technical report. Without technology-specific distinctions in compensation, "You are disadvantaged if you are competing directly against intermittent technologies," said Ramm. Market rules alone can't bring CSP back to life in the U.S. Attacking costs is also necessary. All three executives said their companies are focused heavily on R&D. Heliostats, the mirrors that reflect sunlight onto a power tower, are a primary target. The devices can represent up to 50 percent of a CSP project's cost. BrightSource's Ramm claimed his company had lowered heliostat costs 30 percent by investing in a modular design that makes installation faster and cuts material needs. "We're seeing significant cost savings from project one, to two, to three," he said. "In South Africa, we're pricing in 30 percent lower than we did in the U.S."
Hank Price, Abengoa's chief technical officer, said that CSP hasn't caught up to the same kind of cost reductions seen in solar PV. "But there have been significant cost reductions, particularly in new heliostat designs." SolarReserve's Smith agreed: "We're seeing some pretty dramatic reductions in CSP costs internationally. But we still need more work." The 20,000-megawatt CSP revolution predicted nearly a decade ago for America certainly won't materialize by 2020. But none of these companies have given up on the market. One enabler may be the Obama administration's carbon regulations, which could promote 360 gigawatts of new renewables development by 2040 and compel tens of gigawatts of coal power plants to retire. Along with new greenfield development, BrightSource and Abengoa execs think hybridizing coal plants with CSP or building new plants at shuttered coal facilities offer potential. "There are some opportunities there. Hybridizing is interesting, and full retrofits are also possible. There's all this infrastructure that's already sitting there," said Abengoa's Price. The world has changed for CSP companies. And it very well could change in their favor once again. At least one company, Abengoa, has a contingency plan for an uncertain future: invest in a range of technologies that make the most economic sense, rather than betting on just one. "We think CSP with storage can add value where other technologies can't," said Price. "But if PV with batteries gets cheaper, then we’ll go for that."